China’s human rights lawyers, despite suppression, are continuing to take on the toughest cases, defending Falun Gong practitioners. In China in July 2015, hundreds of human rights lawyers were swept up by an unprecedented crackdown, and many of those lawyers are still in prison and facing torture. Yet, in 2017, lawyers have defended hundreds of Falun Gong practitioners in court. According to the latest statistics from Minghui.org, a U.S.-based website that tracks the persecution of Falun Gong in China, Chinese lawyers have represented over 350 Falun Gong adherents in court and argued for their innocence, since the beginning of the year to the end of October. In October alone, lawyers represented 31 practitioners facing trial. Falun Gong, also known as Falun Dafa, is an ancient spiritual discipline with meditative exercises, and core teachings of truthfulness, compassion, and tolerance. Since its introduction to the public in 1992, practitioners shared with family and friends the improvements in physical health and spiritual well being they had experienced, and the practice spread rapidly in all parts of China among all parts of society. 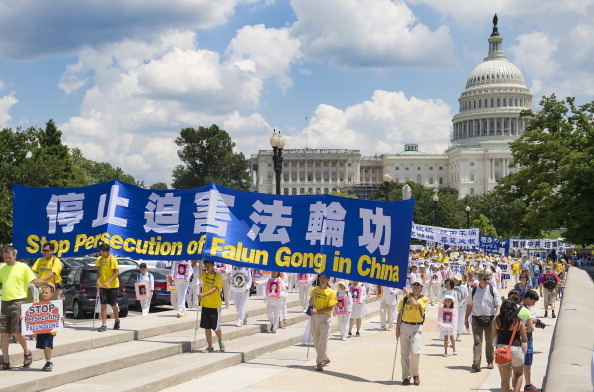 In July 1999, the Chinese regime, headed by then Party leader Jiang Zemin, became fearful of Falun Gong’s growing popularity—the state had estimated 70 million in China had taken up the practice, and practitioners reported that number was 100 million—and launched a nationwide persecution, throwing Falun Gong adherents by the millions into prisons, brainwashing centers, and labor camps, with the goal of forcing them to abandon their faith. Defending Falun Gong practitioners are perhaps the toughest cases lawyers can take in China: Lawyers have been beaten, detained, and had their licenses revoked. By taking the Falun Gong cases, lawyers have an opportunity to argue for the rule of law in China by appealing to the protections in China’s law for freedom of belief and freedom of speech. Two cases from this year illustrate their approach. Liang Jianjun, a teacher of over 20 years at Lechang City Occupation Senior High School in China’s southern Guangdong Province, was kidnapped at her workplace on May 25, 2017, by local public security officers and thrown into a local detention center, according to Minghui.org. The local 610 office, a Gestapo-like secret police force established with the sole purpose of executing the persecution, worked in secrecy with the local public prosecutor’s office to charge Liang with a criminal code forbidding “superstitious sects or secret societies,” which the Chinese regime uses to legitimize the persecution of Falun Gong. On Nov. 7, Liang was defended by a lawyer surnamed Li and another lawyer surnamed Zheng from Beijing, at a Lechang court. To defend Liang, Zheng cited Article 36 of China’s Constitution, which guarantees citizens the freedom of religious belief. The trial lasted for three hours. According to the latest information on Minghui.org, Liang is currently being held at Sangongli Detention Center in Lechang, pending a sentencing announcement expected to come in three months. Wang Yuhong, 54, a former employee working in Beijing’s electricity sector, began practicing Falun Gong in 1996. After July 1999, she was repeatedly persecuted, including being subjected to forced labor and brainwashing. She was also fired from her job because of her faith. The persecution gave such stress and despair to her father that he died shortly after learning that Wang was detained by local public security in March 2008. On May 13, 2017, Wang was once again forcibly taken to a local police station. The police subsequently ransacked her home, taking away four computers, one printer, and several books of Falun Gong teachings, according to Minghui.org. Wang was tried on Nov. 2. She hired Wang Lei (no relation) as her lawyer. On the day of the trial at a court in Chaoyang District in Beijing, Wang Lei argued that the police illegally arrested her by taking Wang away without showing their IDs or an arrest warrant. In addition, the so-called incriminating evidence—books, computers, and other materials about Falun Gong—were baseless accusations given how freedom of speech is guaranteed by China’s constitution. The lawyer argued that freedom of speech makes it lawful for Falun Gong materials to be published and for Wang to possess them. Wang has since been sentenced to one-and-a-half years in prison.